Well the Missus and I trundled down to the Big Town over the weekend and say, it was swell . . . weather. On Thursday we hit the American Folk Art Museum for Self-Taught Genius: Treasures from the American Folk Art Museum. It was . . . smart. Then we saw Act One at Lincoln Center, which was kind of hokey but featured terrific performances in multiple roles by Tony Shaloub and Andrea Martin. Friday we went to the Museum of Art and Design (which the headscratching staff increasingly doesn’t get) for Re:Collection and Multiple Exposures: Jewelry and Photography. They were, well, smarter than we are. Then we went to Central Park. And sat. And say, it was swell. We watched two herons glide and swoop and disappear and reappear and perch and push off for parts unknown. It was a great show. But we did like Lygia Clark: The Abandonment of Art, 1948–1988 at MOMA. So there. Later we went to the New-York Historical Society to see Bill Cunningham: Facades. 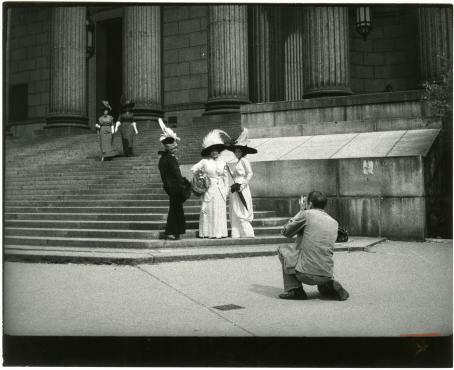 In 1968, photographer Bill Cunningham embarked on an eight-year project to document the architectural riches and fashion history of New York City. Scouring the city’s thrift stores, auction houses, and street fairs for vintage clothing, and scouting sites on his bicycle, Cunningham generated a photographic essay entitled Facades, which paired models—in particular his muse, fellow photographer Editta Sherman—in period costumes with historic settings. Let’s just say this: Cunningham + Editta Sherman does not = Cindy Sherman. Saturday we went to the Jewish Museum for Masterpieces and Curiosities: Diane Arbus’s Jewish Giant. It was, well, smaller than that. Then back to Central Park, where we sat and listened to a kickin’ jazz band, wandered up to Belvedere Castle, and saw a disproportionate number of red-headed people. Finally, pay-what-you-wish-night ($22 admission fee? seriously?) at the Guggenheim for Italian Futurism, 1909–1944: Reconstructing the Universe. We really liked it, and Jonathan Galassi’s New York Review of Books piece will tell you why. But we’d still rather be in Central Park on a beautiful spring day. This entry was posted in Uncategorized and tagged 1909–1944: Reconstructing the Universe, Act One, Andrea Martin, Belvedere Castle, Bill Cunningham: Facades, Central Park, Charles James: Beyond Fashion, Cindy Sherman, Daniel Goodman, Editta Sherman, Gauguin: Metamorphoses, Guggenheim, Italian Futurism, Jewish Museum, Jonathan Galassi, Judith Thurman, Lygia Clark: The Abandonment of Art 1948–1988, MAD, Masterpieces and Curiosities: Diane Arbus’s Jewish Giant, MOMA, Multiple Exposures: Jewelry and Photography, Museum of Modern Art, New York Review of Books, New Yorker, New-York Historical Society, Re:Collection, Self-Taught Genius: Treasures from the American Folk Art Museum, Strawberry Fields, The Black Fives, The Met, Tony Shaloub, Weekly Standard. Bookmark the permalink. As you get older, John, the time in the Park will consume more of your time. So…you came home to rest up for your next trip, eh? That’s pretty much the size of it, Mudge. Curious how many red-headed people is a disproportionate number. According to Yahoo, “less than four percent of the world population has naturally red hair. That is less than two percent in America.” I’m pretty sure we saw more than two in a hundred Central Parkers.